It’s about time that we featured another lively piece from Martinique…or Martinique via Paris. Martinique has been a French possession since 1815 without interruption, although previous to that, it had been occupied by the French off and on since the 1600s. Today, it’s technically an overseas region of France, like Réunion and Guadeloupe. The population of Martinique is said to be descended mainly from West African slaves, as well as immigrants from a variety of cultures, including European, Carib, Chinese, and Tamil, among others. Creole is spoken, though the official language is of course French. This is all basic information, but it can be helpful when considering the complex origins of Martinique’s singular music, which, while undoubtedly influenced by the French, occupies a unique place in the history of jazz. Orchestral biguine, the music featured on this track (as well as the name of a dance), dates from the 19th century, developed in the city of Saint Pierre. Musically, it is directly related to a very different sounding traditional drum music of Martinique also known as biguine, which is descended from West Africa. Perhaps the quintessential element in the orchestral type of biguine is the wonderfully weepy clarinet – it’s unmistakeable. In France, beginning in the late 1920s, there began almost a Martiniquan music craze, centered around the music played at several clubs, particularly the Bal Colonial on Rue Blomet. The first discs made of this music, mainly those recorded by the giant of early Martiniquan biguine, Alexandre Stellio (1885-1939), ushered in what is considered the “golden age” of Martiniquan jazz. 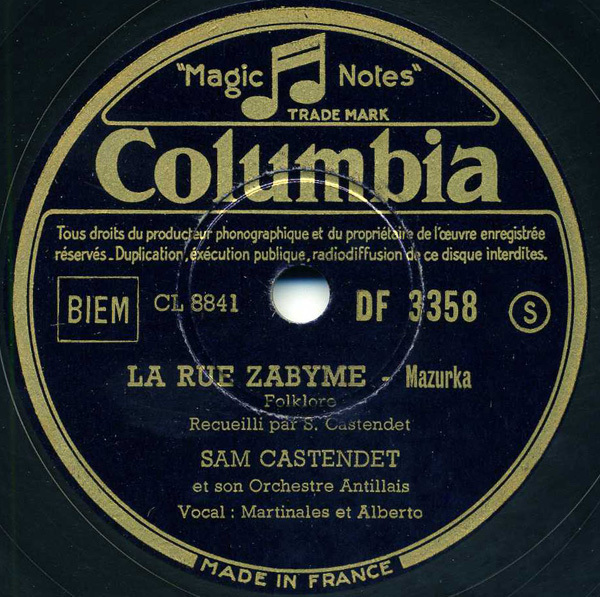 The standard repertoire of these bands, who often traded musicians and vocalists, included biguines, mazurkas, and waltzes, recorded from roughly 1929-1940. They are some of the most spirited examples of hot jazz from the Caribbean, or maybe jazz anywhere, for that matter, and were performed by the best Martiniquan and Guadaloupean musicians around. Martiniquan music represented cosmopolitan Paris. Eugène Delouche (1909-1975) was one of the great clarinetists to appear on record just after Alexandre Stellio made his first recordings. Delouche studied music in school in Fort-de-France. The violin was his first instrument, but after he heard Alexandre Stellio, the story goes that he immediately switched to clarinet, and was one of Stellio’s very few rivals within a short time. It was Stellio himself who beckoned Delouche to replace him in the Martiniquan band for the Colonial Exposition in 1931. Within a year, Delouche was recording his own band for the French division of the Odeon label. Delouche had a lengthy career. He continued to record extensively in the post-WWII era, particularly on his own Ritmo label with his Creole jazz band. He was also a trained cobbler, and continued to repair shoes until his death in Saint-Ouen, where he was also working as a taxi driver. Many great examples of early Martiniquan jazz have been reissued. These reissues, with the exception of a terrific Arhoolie release (Au Bal Antillais), have mainly been in France, and many have now gone out of print. Fremeaux, thankfully, has kept their three 2-CD sets of the history of biguine in print, as well as the complete recordings of Alexandre Stellio, and those are findable. This track, originally recorded around the middle of 1932, looks to have once been reissued years ago on a CD titled “Creole Orchestras In Paris” that seems to be long out of print. So, I thought I’d resurrect it here with a new transfer from my copy. There are numerous types of Martiniquan music, but one form that proved quite popular in early recording, even becoming something of a craze, is known as biguine, an orchestrated popular music vaguely similar to calypso or a rhumba, and where the clarinet and trombone have a strong presence. Typically, the clarinet is played with, for lack of a better word, a weepy sound – which you might find similar to the late-1930s Boateng record I posted a while back…an example of direct, cross-Atlantic influence. 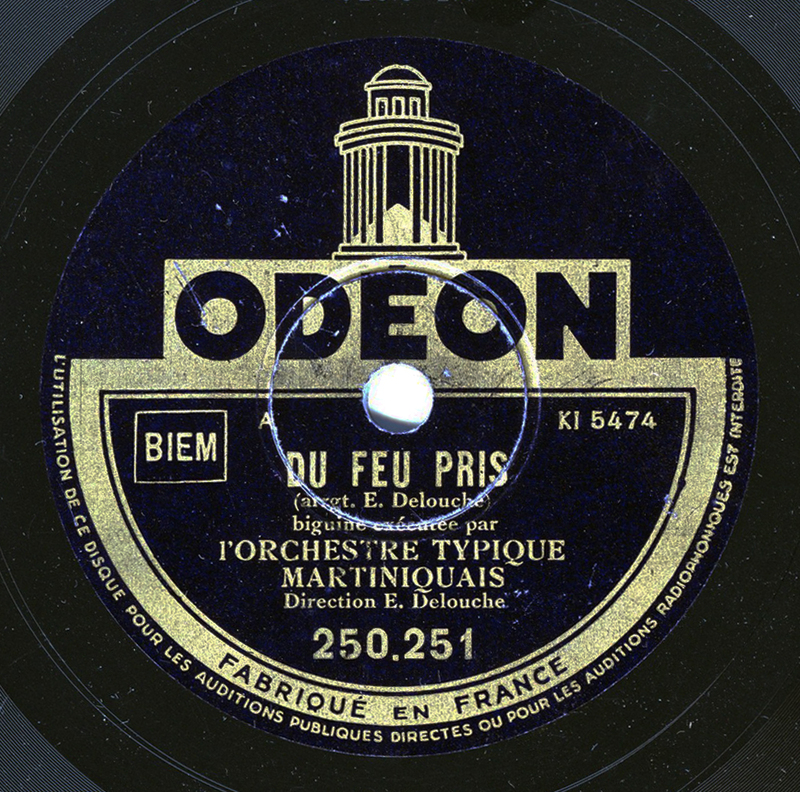 Most, if not all, early Martiniquan bands recorded in Paris, beginning from about 1930, when the great Alexandre Stellio began recording for Odeon. Sam Castandet appeared on the scene not soon after, and had a recording career that lasted at least until the 1950s. This track has the typical orchestration for a biguine tune, but is meant to be danced as a mazurka – it was recorded ca. 1940. There are a few nice CDs of early music from the “French Antilles.” Au Bal Antillais on Arhoolie, and Music of Martinique on Flyright are two examples. Another that looks like it may be harder to find is Biguine, Valse Et Mazurka Creoles 1929-1940, released on Fremeaux & Associes.